What is the version of .Net framework on computer? .Net framework is required for number of applications. For different applications, different version of .Net framework is required. If a specific application needs version 3.0 and not version 2.0 – how can you check for the existing version of .Net framework installed on the computer? 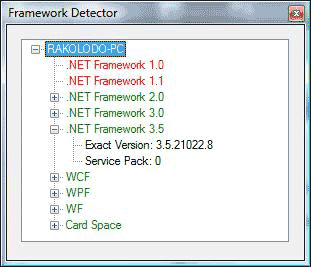 Framework detector is a handy utility that shows the version of .Net framework currently installed on computer. With this utility, exact version can be known and hence compatible applicationÂ can be run with ease. Download Framework Detector [23k], unzip it and run it. There is no need to install, this small utility can be of great use in attempt to dig out the version of .Net framework installed on the computer. Great program, thank you for the sourcecode.